A diagram of how molecules are arranged in a solid. Solid is one of the four common states of matter. The molecules in solids are closely bound together, they can only vibrate. This means solids have a definite shape that only changes when a force is applied. This is different to liquids and gases which move randomly, a process called flow. When a solid becomes a liquid, this is called melting. Liquids become solid by freezing. Some solids, like dry ice, can turn into gas without turning liquid first. This is called sublimation. The forces between the atoms in a solid can take many forms. For example, a crystal of sodium chloride (common salt) is made up of ionic sodium and chlorine, which are held together by ionic bonds. In diamond or silicon, the atoms share electrons and make covalent bonds. In metals, electrons are shared in metallic bonding. Some solids, like most organic compounds, are held together with "van der Waals forces" coming from the polarization of the electronic charge cloud on each molecule. The dissimilarities between the types of solid come from the differences between their bonding. 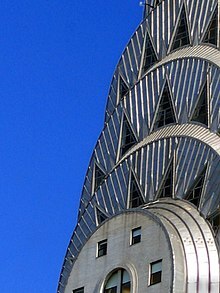 The pinnacle of New York's Chrysler Building, the world's tallest steel-supported brick building. Most metals are strong, dense, and good conductors of both electricity and heat. The mass of the elements in the periodic table, those to the left of a diagonal line drawn from boron to polonium, are metals. Mixtures of two or more elements in which the big component is a metal are known as alloys. People have been using metals for many purposes since prehistoric times. The strength and relialbility of metals has led to their widespread use in making of buildings and other things, as well as in most vehicles, many tools, pipes, road signs and railroad tracks. Iron and aluminium are the two most commonly used metals. They are also the most common metals in the Earth's crust. Iron is most commonly used in the form of an alloy, steel, which has up to 2.1% carbon, making it much harder than pure iron. Since metals are good conductors of electricity, they are valuable in electrical tools and for carrying an electric current over long distances with little energy loss. Because of this, electrical power grids rely on metal cables to get electricity. Home electrical systems, for example, are wired with copper for its good conducting uses. The high thermal conductivity of most metals also makes them useful for stovetop cooking utensils. A collection of different minerals. Minerals are natural solids formed through many geological processes under high pressures. To be thought as a true mineral, a substance must have a crystal structure with uniform physical things throughout. Minerals differ in composition from pure elements and simple salts to very complex silicates with thousands of known forms. In contrast, a rock sample is a random aggregate of minerals and/or mineraloids, and has no specific chemical composition. Most of the rocks of the Earth's crust have quartz (crystalline SiO2), feldspar, mica, chlorite, kaolin, calcite, epidote, olivine, augite, hornblende, magnetite, hematite, limonite and a few other minerals. Some minerals, like quartz, mica or feldspar are common, while others have been found in only a few places in the world. 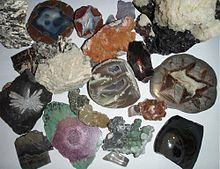 The largest group of minerals by far is the silicates (most rocks are ≥95% silicates), which are made largely of silicon and oxygen, also with ions of aluminium, magnesium, iron, calcium and other metals. This page was last changed on 18 March 2019, at 02:02.